High Intensity Mixing can be thought of as mixing that requires lots of energy and heat. The typical tip speed of the mixing tools will be greater than 25 meters per second. Chemical reactions are generally achieved in such processes where fusion or absorption is essential. 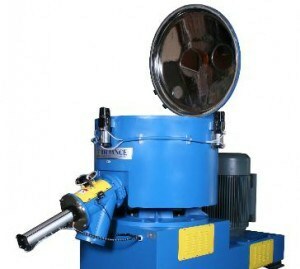 They can be used to create agglomerates and vacuum dry materials. 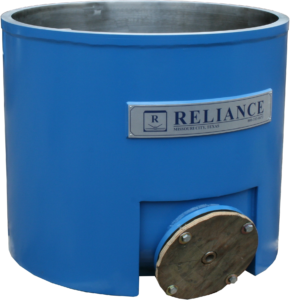 Reliance High Intensity Mixers come in our Standard, Direct-Drive, and budget friendly E-Series designs. Our High Intensity Mixers are manufactured with efficiency and user friendliness in mind. The Assemblies and Components are engineered to maximize production and minimize down time associated with a plant’s maintenance program. 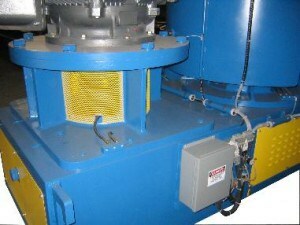 High Intensity Mixer Discharge: Reliance High Intensity Mixer Discharge openings are designed for fast and efficient removal of material from the Mixer Bowl. 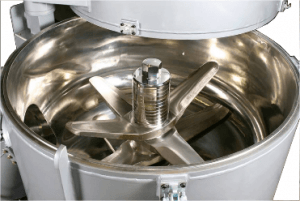 The larger the opening the faster the product discharges from the mixer bowl, which is why Reliance High Intensity Mixers are supplied with up to 12″ discharge openings to shorten cycle times. 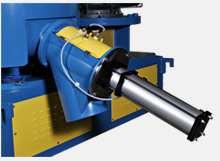 In addition, the assemblies can be supplied with easy clean features that facilitate fast turn-arounds. High Intensity Mixer Lid: Reliance High Intensity Mixer Lids are flanged dished ends that are machined flat and supplied with a dome shaped gasket. The gasket supplies a leak proof seal with the top ring of the mixer bowl. 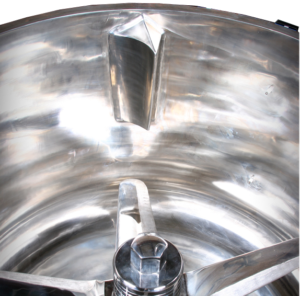 Reliance High Intensity Mixer Lids are constructed out of Stainless Steel and can be mirror polished for easy cleaning. They can come in a Clam-Shell, Swivel, or Pivot / Tilt Design. High Intensity Mixer Tools: Reliance High Intensity Mixer Tools are specially designed to fluidize material and create a deep vortex flow pattern within the Mixer Bowl. They are self-cleaning and are supplied with a wear resistant coating to extend the life of the tool. Uniquely engineered tools can be provided to suit your mixing and application needs. 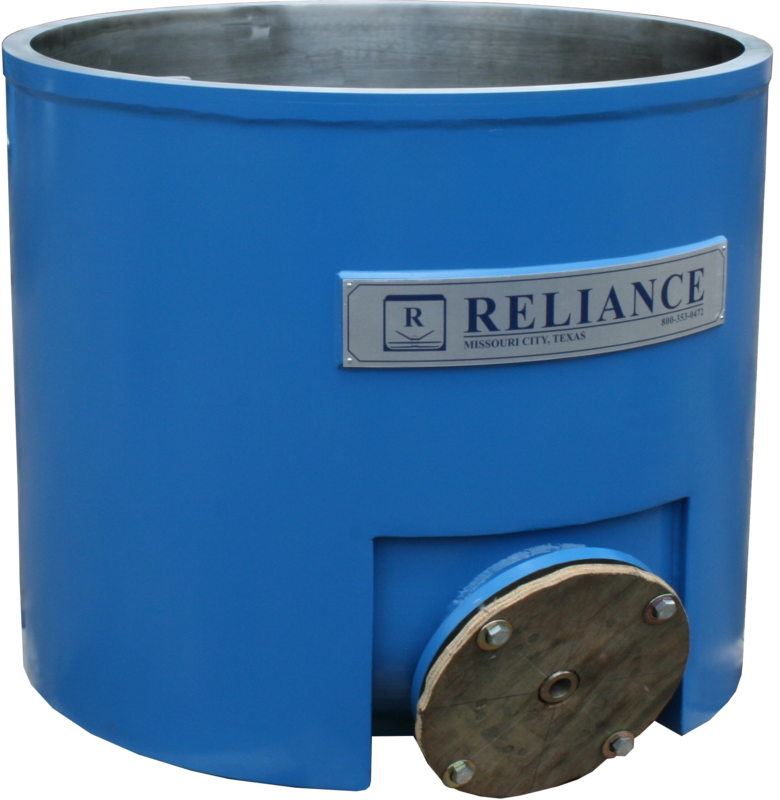 High Intensity Mixer Deflector: Reliance High Intensity Mixer Deflectors are designed to turn the material into the vortex of the mixer. By forcing the material back into the center of the bowl, a highly homogenized end product can be achieved. In addition the frictional heat generated within the bowl increases due to the forced impaction of particles. The deflectors can be mounted on the lid or can be welded or bolted from the side wall of the bowl. Reliance side wall deflectors can be adjustable or fixed. High Intensity Mixer Bowl: Reliance High Intensity Mixer Bowls are made out of a Stainless Steel construction. Specially engineered bowls can be supplied in a two-piece design for applications where cleaning and cross-contamination is an issue. Mixer Bowls can be made with or without a jacket. To elongate the life of the bowl, the lower third of the bowl can be coated with wear-resistant coating. In addition, the bowl bottom can be made out of thicker material extending the natural life of the bowl material. High Intensity Mixer Bearing Housings: Reliance High Intensity Mixer Bearing Housings are cast and precision machined. They are made of a Two-Piece design which allows the bottom piece to be dropped without disassembling any of the major assemblies. Bearings can be easily changed out and the bottom piece can be reassembled prior to start-up. 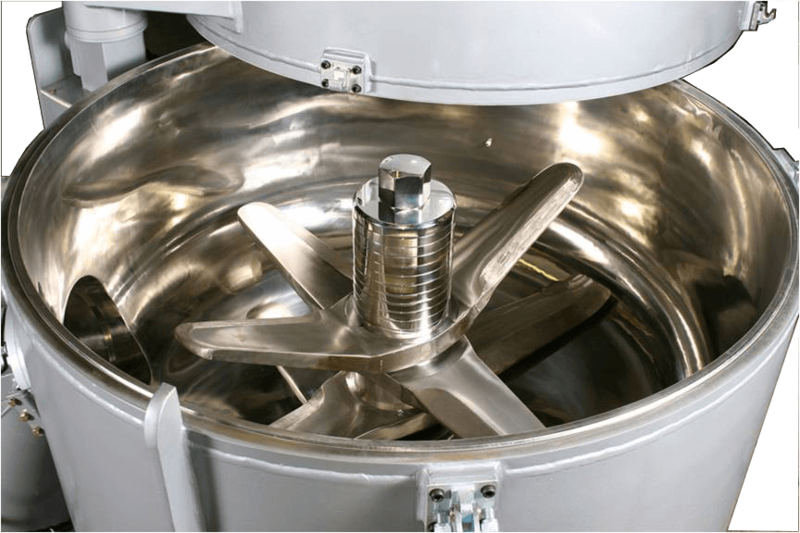 Units ranging from 500 to 2000L have a design that allows the Mixer Bowl to remain in place while the lower section of the bearing housing can be dropped down from below. The 800-2000L units have a design that allows the Motor to remain in place while the lower section can be dropped. Down-Times are drastically reduced.